Interdine responds to the global phenomena of mass displacement and migration acting on a local scale and identifying the moral role of architecture within it. There are many facets to the problem defined by the western world as “Refugee Crises” but the focus of the project has been on the actual moment of Integration, a term that Interdine has re-defined through time. Bringing light on EU migration policies, the aim of Interdine has been to create a more welcoming state of Refuge, acting on a local scale. Carefully avoiding to fall into institutionalising the problem or infantilising its subjects, the project proposes two scales of intervention based on a continuous program: a 1:1 live action project (a platform for integration through food) and a speculative design proposition to claim space for it . Interdine (interaction + dining) was born in my home kitchen and developed in a series of public discursive dinners occupying key spaces in the city centre of Umeå. Through a dialogue of reciprocity the dinners became the site where the term Integration was re-defied as `mutual transaction´: a pure interaction or exchange between people, from which both subjects come out enriched. Each Interdine event took place in the presence of food. Food became the medium for language exchange, culture exchange and culinary exchange. Being located every time in a new place, each Interdine created a new topography merging the meal setting with the surrounding. 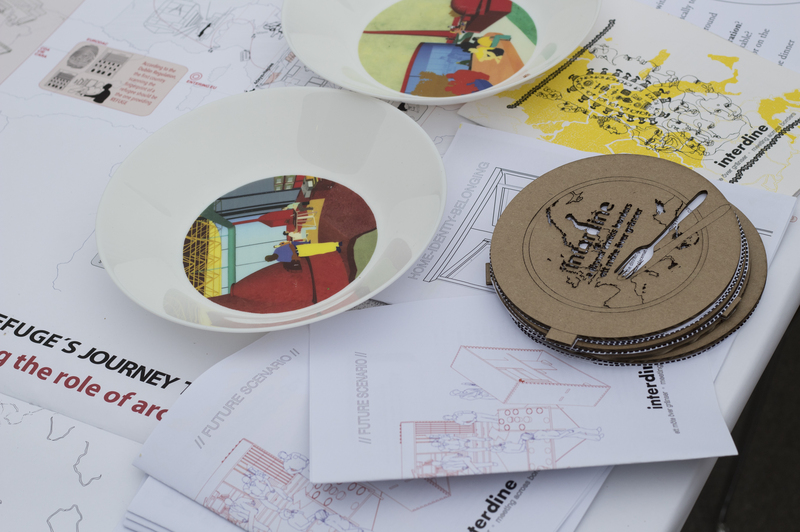 A drawing or a map used as a table cloth, cardboard menus to initiate the ritual, fanzines functioning as invitation cards elaborating on the discussion themes and decorated plates were the series of artefacts creating the dinner setting. On a second sclae of action, the architect´s moral role is to use design to claim space. 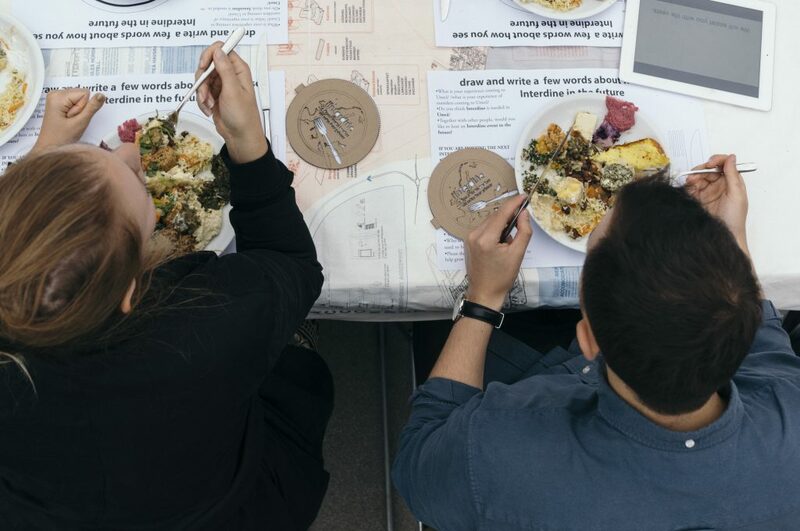 At this point Interdine evolves in a speculative design proposition: Interdine Restaurant, a permanent infrastructure to host discursive dinners. The ultimate goal of the project is to let interdine become an active part of the city, a reference point for mutual transactions between refugees and local residents so as to enrich each other and the city itself. Claiming space for interdine is fundamental for passing on and handing over the act of hosting to Interdine´s participants, as a way for them to host others and let Interdine continue acting in the future of Umeå. The map shows how the schengen area is hindering free movement of outsiders. 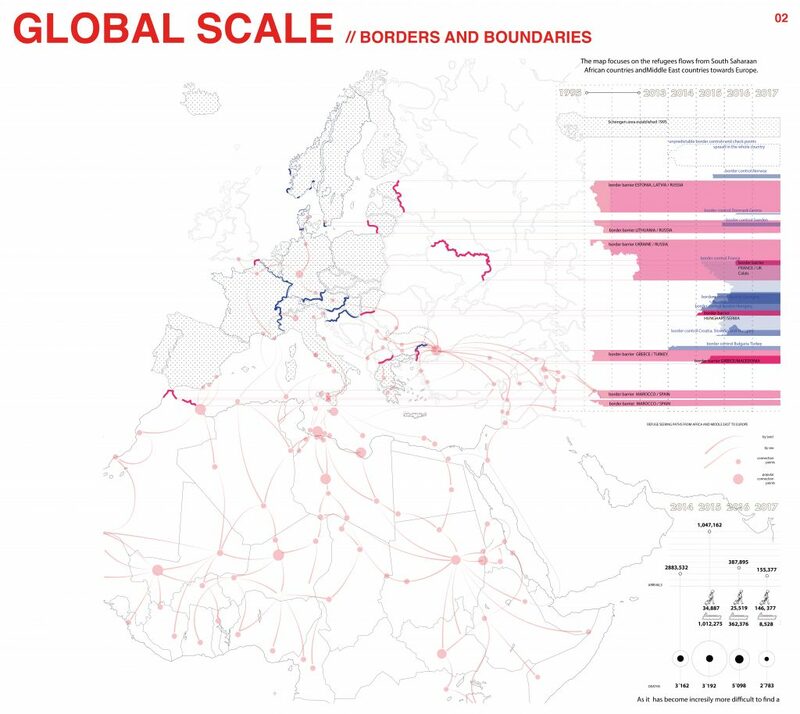 It explains the borders and diffuclties continuously faced by refugee enetring Europe. Today, an unprecedented 65.6 million people around the world have been forced to leave their home. Among them, there are nearly 22.5 million refugees fleeing from misery, environmental defacement, wars and harassment; mainly coming from south saharan countries and middle eastern one. After the peak of incomers in 2015, Europe started shutting its borders. Since then, the number of approved asylum applications in Europe has decreased drastically. In the meanwhile, the urgent need for integration has increased in all welcoming states. 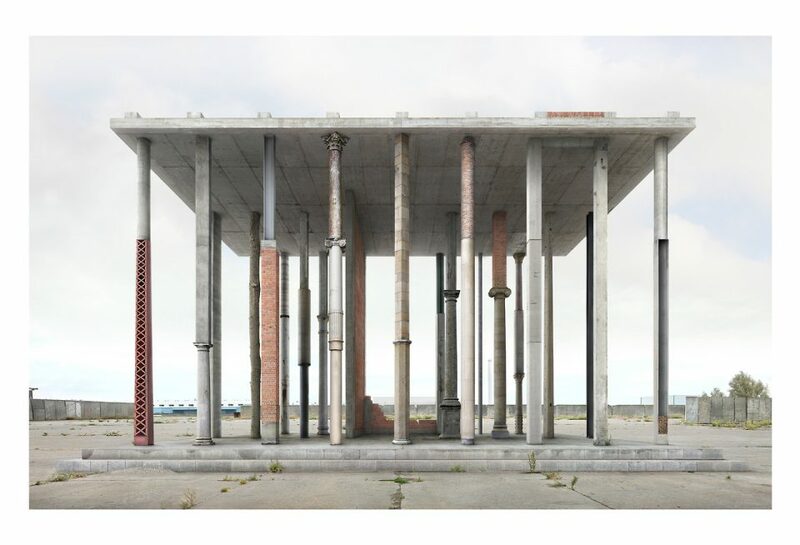 Interdine is an action reserach project, investigating the moral role of architecture in an era od mass migration and the subsequent need for integration. The research project analyzes the global issue through the local lens of the situation in Umeå, a norten Swedish city. Having reached Sweden, refugees are being located according to where the Migration Agency can find accomodation for them. This happens often without considering their relation to the surroundings, hindering the process of integration to take place. The map shows the challenges of a refugee´s journey entering Europe through the mediterranean. This journey was documented and understood with the help of a friend and colleague Nour Baker, a Syrian refugee, who shared his story. Attempting to understand the role of architecture along this journey, visualising the spaces carachterising each phase became a proof of evidence. The aim of the map is to better communicate the challenges of a flee. Yet the representation will never be able to transmit the feelings, the thoughts and the live experience of Nour. 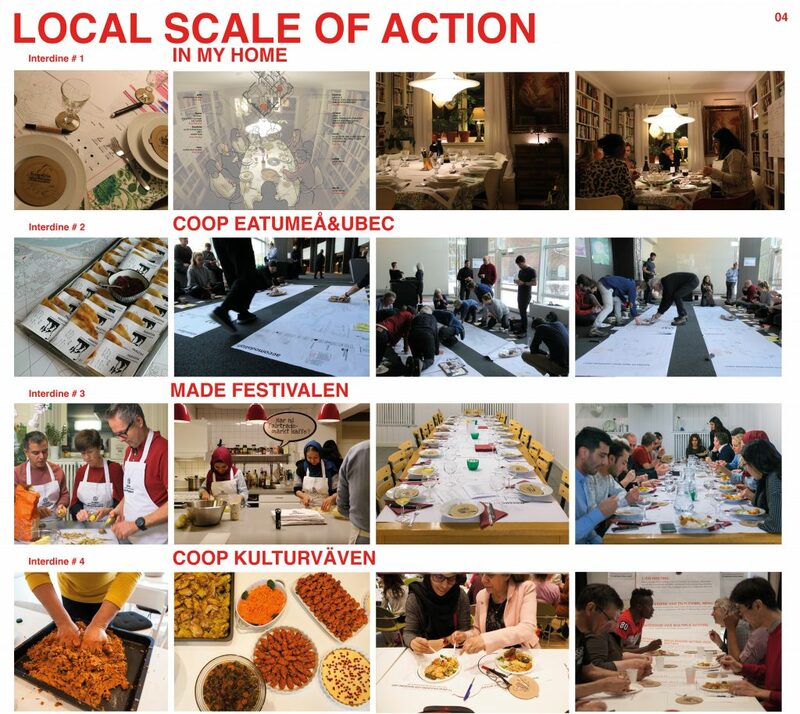 In its first, most intimate scale of action, Interdine grew as an action-reasearch project that created a platform for integration through food and dining. 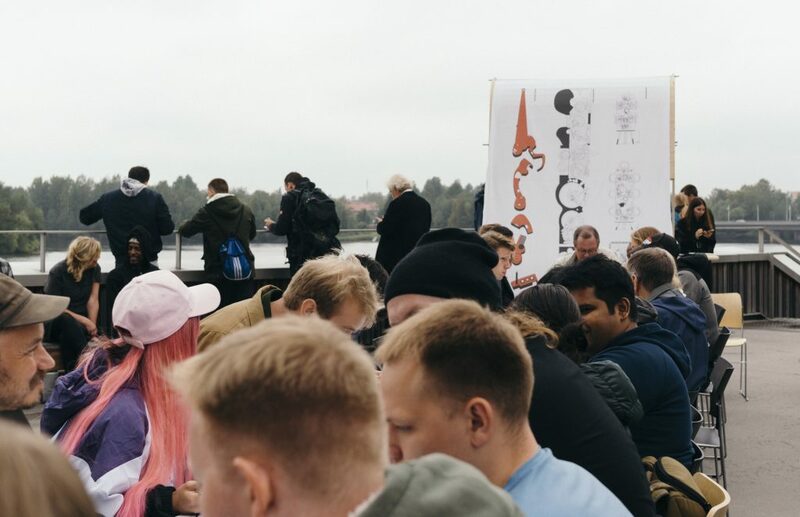 From hosting 9 people in my home kitchen, Interdine grew to the size of public events occupying key public spaces in the city centre of Umeå and involving up to 100 people. At each dinner, diverse actors involved in the issue of refuge seeking and integration come together around a dinner table and through food, discuss relevant issues and collectively try to find possible solutions to them. Usually the menu is created combining typical food coming from the countries of origin of the different participants. While the discussions happen in between courses, the food is often prpared together before the dinner. This helps in the exchange of cultural knowledge and understanding, while at the same time adding a human touch to a phenomenon largely controlled by laws and established systems. Over the course of 6 months , Interdine hosted 5 events collaborating with different actors, refugees, NGOs, and public institutions such as EatUmeå, UBEC, Norrlands Opera and MADE festival, Umeå Municipal Library, Individuell Människohjälp and Bildmuseet. 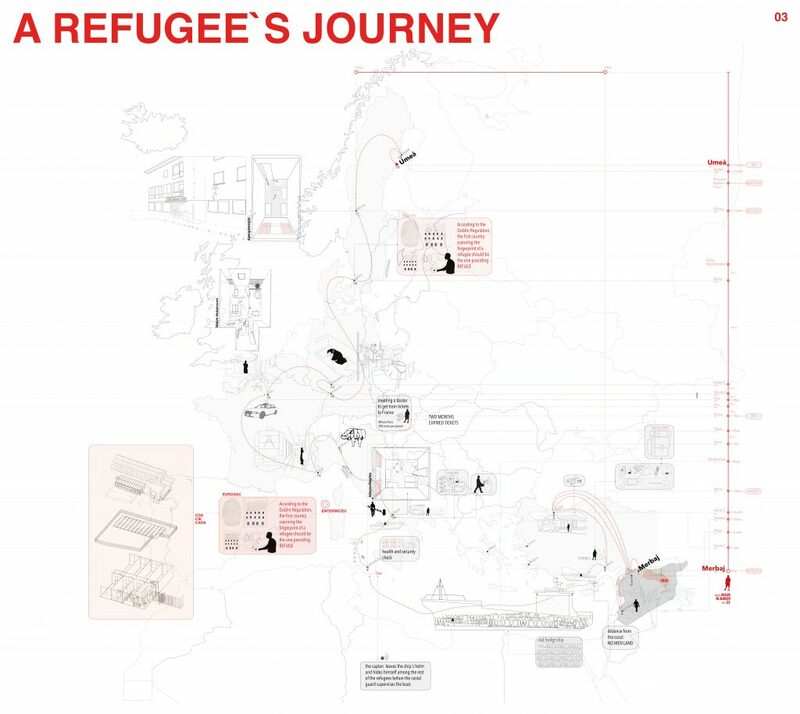 The map explores the existing infrastructure for refugees in Umeå and the local organisations working with Immigrants. The analysis of the local situation showed that there was a considerable distance between the organisations working with refugees, placed in the city centre, and refugee accomodations placed at the outskirts of the city. By creating a platform for mutual transactions, Interdine has started a network of collaboration and interaction between the diverse actors, aiming to bring the issue to the core of the city.In the city centre of Umeå, Kulturväven, Umeå cultural house, has been criticised for commodifing and commercialising culture in Umeå.Thus, the cultural house was identified as a key site in which to claim space for Interdine and give visibility to `,integration´. In order to test the future site of intervention Interdine built up in scale till it took over the biggest and simbolic civic centre of the city, Kulturväven, making it a richer enviroment suitable for hosting. To address the modern era of mass displacement and the subsequent need for integration, Interdine becomes at this point a scalable design strategy. The moral role of the architect as a host is to claim space for Intedrine and create a permanent infrastructure for it: the Interdine Open Restaurant. The key site of intervention is the balcony and terrace of Umeå Cultural House, left unused and unprogrammed. Connected to the present building, the restaurant functions independently regardless of the cultural house´s opening hours, allowing people to use the space during nights.Being a social catalyst for refugees and local people to get together and exchange taste and knowledge about cuisine and hosting cultures, its architecture generates specific spatial qualities: the space is open and yet intimate thanks to the human scale of volumes, it allows chance encounters and enhances the importance of sensorial qualities. 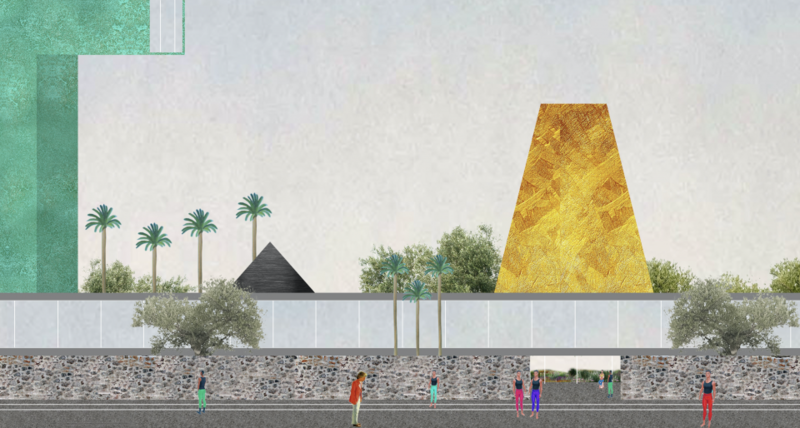 The food is in fact in the center of the design and program considerations: here food preparation, dining rituals and combination of cooking cultures are made possible by the restaurants main space. A long continuous oven incorporates a combination of vernacular ovens coming from the areas from which refugees are fleeing. Diverse cooking cultures are displaced simultaneously on the same surface, giving refugees the opportunity to act as hosts, and give the local community insights into the respective cultures through typical dishes. The oven creates a space for workshops, cooking classes and local and exotic cuisines, allowing for fusion and experimentation. To keep the informal athmosphere of Interdine discursive dinners alive, a fundamental part of the proposition is to focus on the way in which food is consumed together. The table is the base and main stage for integration to act upon. In Interdine Restaurant, the dining rituals are enabled by the presence of interchangable tables of different sizes and heights. Aiming to maintain the intimate atmosphere for a `dialogue of reciprocity`, the tables allow different scles of interaction. The square table creates the most intimate and informal encounters (2-4 people), the optimal size of an interdine is allowed by a 90 degree arch table (6-8 people), while the biggest arch table allows a bigger dinner size (9-11 people). These different tables can also be combined together through a X joint present on the tabletop surface and create longer tables of different shapes. This would allow a bigger scales of discursive dinners and forums to take place on the second floor and terrace of the restaurant. The project main aim is to pass on and hand over the act of hosting to others: the hosted. During time, a list of guidelines for future hosts and a series of arefacts and tools have been created to host each dinner. Interdine gifts this discursive dinners KIT to the future hosts, to mantain the network for integration alive and active in the city. In the past, Interdine has allowed encounters through food, tought to local inhabitants to learn from incomers, and to refugees to accept and embrace the culture they have come to. In the present, we learn that integration is about receiving and giving. In the future, Interdine hopes that by changing the attitude towards the culture of integration we will be able to change the systematic processes and structures affecting it.The refugee crises is the way we deal with it. It is not about refugees, it is about all of us. We know that physical borders can stop and kill refugees, but can borders stop migration? The need for integration in our cities is not an opinion, but a fact shaping the whole Europe. With its specific expertise of building human transactions in space, Interdine is not geographically limited to the area of Umeå. Seen as the ground on which to design social engagement possibilities, Interdine, in its two scales of action, is transferable to other European scenarios. Determined to shift the stigma attached to migrants and the negative narrative around population movements, the hope is to promote agency among refugees and local inhabitants to strengthen ties. 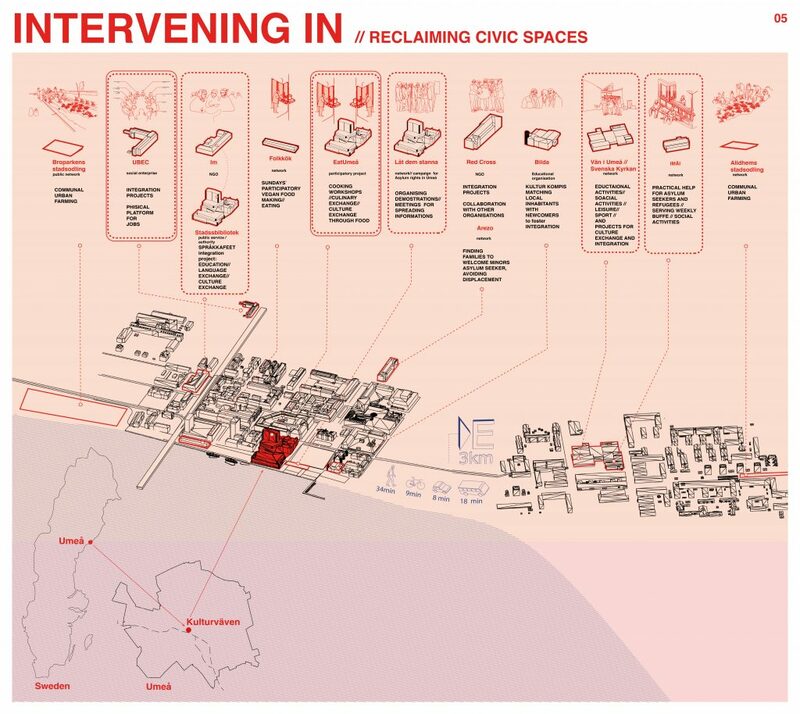 To end, Interdine calls for an invitation to other spatial practitioners and citizens to get involved in hosting as a methodology of engagement and transmission of agency. Mutual transactions in space will then be easier to spread. 1 CO•HOSTING: at least two hosts hold the dinner (one local inhabitant, one outsider): together, they meet before the event, get to know each other and discuss how to best combine typical food from different nations in one meal. This allows language exchange, culture exchange and cuisine based knowledge exchange. The menu is thus flexible: es. course 1 (A country) course 2 (B country), or mix different recipes in one course etc. It is fundamental to create an atmosphere of security, intimacy and freedom to express oneself. In order to do that, Interdine requires a high level of respect for one another. This is mostly allowed by the ptimal size of Interdine hosting 8-10 people. If participants are more, multiple tables, each hosting 8-10 people, will be connected to each other. 5 EACH COURSE IS FOLLOWED BY A DISCUSSION OR A STORY. The theme should relate to the emotional and political aspects of that specific food or country through a visual presentation between courses. 6 FUNDING: Participants in Interdine pay a voluntary fee. Some of the events were run in collaboration with public entities and NGOs who covered most of the expenses. Locally, there is the possibility to apply for funding: through the organisation of Svenska Kyrkan (Swedish Church) or Umeå Fritid at Umeå Municipality. 7 PRACTICAL ISSUES TO DECIDE: Who collects the money, who provides the ingredients…etc. 8 PLACE: pitched to Väven as an already present public space, the aim is to create a fixed place for Interdine. The dinners can also move from home to home and, if possible, between different public spaces in the city. The dinner setting can adjust to a table of different heights and dimensions or it can take place on the ground. 9 TOOLKIT: the toolkit constructed to host the dinners allows the table cloth to roll down over the table and become the base for the dinner as well as a display for the discussion. The kit is a mobile structure that provides storage for fanzines, menus, basic tools for the dinner, table cloths, ingredients. It also present a shelf specifically built to store typical trays, pots and tools used during the first Interdine sessions. What prompted the two sides of the project? from the action & research to the speculative? a 1:1 live action-research project, a platform for integration through food, and a speculative design proposition to claim space for it . By creating a platform for mutual transactions, Interdine started a network of collaboration and interaction between diverse actors and brought the issue of refuge seeking and the need for integration to the core of the city. At this point, seen the importance, appreciation and need for Interdine, the moral role of the architect became to use design to claim space for Intedrine and create a permanent infrastructure for it: the Interdine Open Restaurant. In order to test the future design proposition Interdine built up in scale till it took over the biggest and symbolic civic centre of the city, Kulturväven, making it a richer environment suitable for hosting. 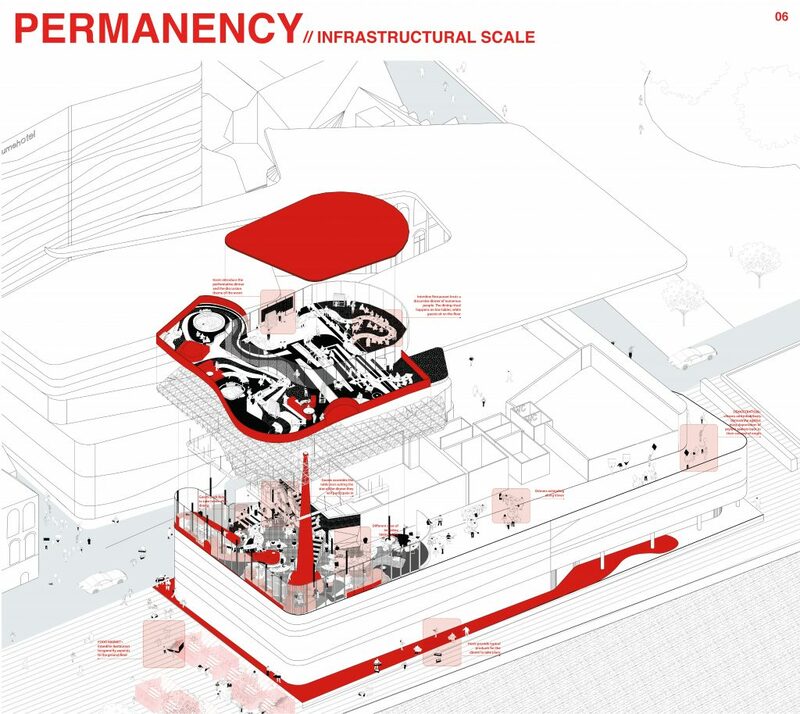 If the action research was used to test and inform the design proposition in scale 1:1, the design of its infrastructure itself reflected the need for Interdine and its importance in the city. 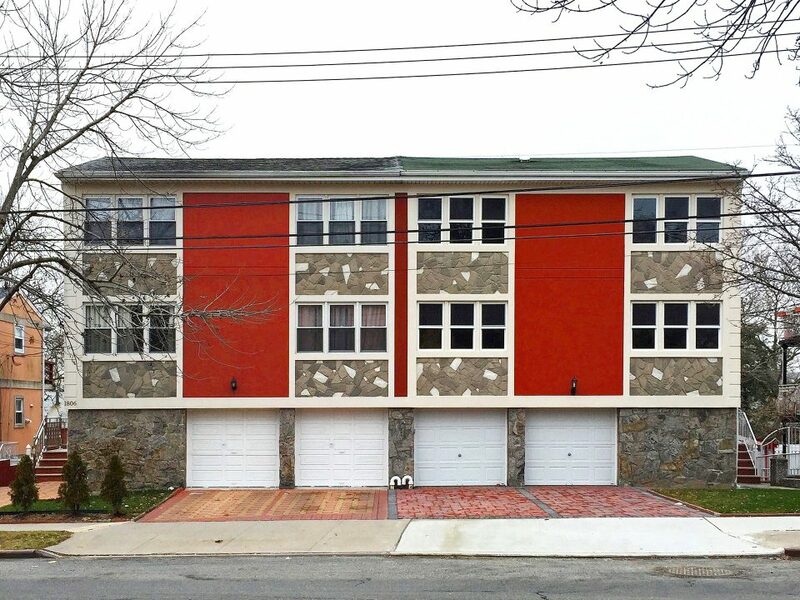 Design was used to give permanency to integration and claim space for it. What initiated your interest in food and the potential of the meal as a means to gather and be a catalyst for discussions? If food is at the basis of human survival, the way in which food is consumed and shared creates the features of culture identity and social rituals. In the context of a Swedish northern city, typical food and cuisine from foreign countries become the material of common interest, fundamental tools to enable encounters between strangers. Rhythmical, performative, shared and mimetic, the meal became the tool used for creating relations going beyond boundaries. Yet food was the medium for language exchange, culture exchange and culinary exchange. Considering these conditions, designing the architectural setting of the shared meal became fundamental for hosting each Interdine event. Being located every time in a new place, each Interdine creates a new topography merging the meal setting with the surrounding. The setting of the meal on the dinner table is often composed by a drawing or a map as a table cloth, cardboard menus to initiate the ritual and fanzines functioning as invitation cards as well as elaborating on the discussion themes. In this way the setting of every meal, being it on the ground or on a kitchen table, gives rise to a series of thoughts elaborated in the talk and discourse of the dinner. As the guests and the hosts bring to the dinner table different opinions and points of views, the dinners allow an agonistic confrontation and a pluralist discussion to take form. Also, we tend to think of architectural settings as essentially spatial configurations, forgetting to consider the temporal character of the meal. The extended temporality of the shared food allows the disclosure of the meal in its different stages, from tactile to emotional. Interdine promotes the replication of similar performances in space through the city. How did the project change and evolve from the scale of the home dinner to that of a public event? What were the biggest challenges you faced? Interdine was born in my home kitchen, where 9 different actors, involved in different ways in the issue of refuge seeking and local processes of integration, came together to discuss relevant problems and in cooperation find possible solution to them. The goal was to create a spontaneous and intimate environment for strangers to interact. The first proposed discussion theme was, in fact, the meaning of `HOME`. Although the discussion brought disagreement and confrontation, almost magically, the first dinner had set the basis for the next one to take place, in another realm. The network had already started. 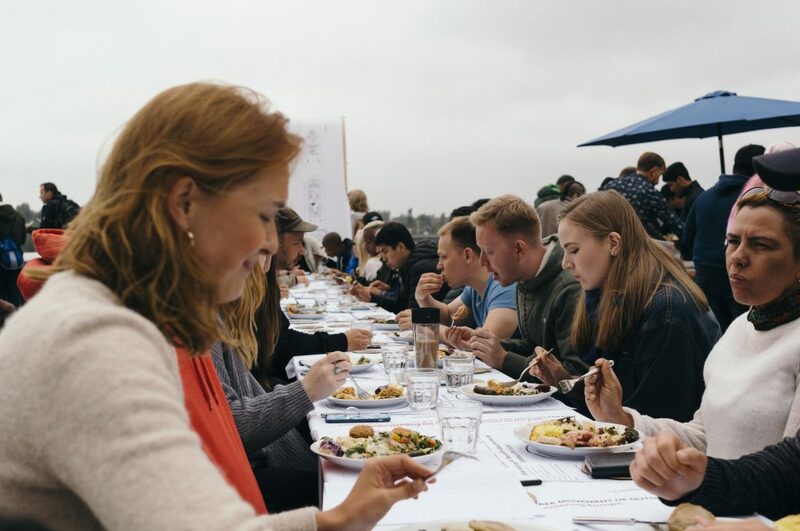 During time, the dinners grew organically, involving refugees, newcomers, NGOs, social enterprises, local inhabitants, the governmental bodies of the Social Employment Service and the Swedish Migration Agency, students of architecture, project managers, volunteers and professors. Through a dialogue of reciprocity and exchange of knowledge, we have tried to find cracks and missing points in the system as well as create potential outcomes for future scenarios. Each time people would suggest or offer a new place to host Interdine in the city. By creating a platform for mutual transactions, Interdine started a network of collaboration and interaction between the diverse actors, with the aim to bring integration to the core of the city. – understanding that the outcome of the dinner wouldn’t always be as you expect it to be. After having designed the setting of the interaction, the discussion and the meal, take a step backward and OBSERVE! Do not try to control the outcome of the interaction. With time one understands that this in itself is the meaning of integration and the key guideline for mutual transaction. • divide and share the work! Don’t bare all the weight of the process on your own shoulders! (I often did everything myself. I had to do the research, the event, the food, the discussion, the organization, control the practical issues, collecting the money, provide the ingredients…etc. Slowly I started involving people and share the amount of work, I realized, is crucial! • BE PATIENT!! It´s a long and often slow process! Do not force it! What role does the table hold within these gatherings? How important was the design of this in relation to the function of it as interactive catalyst? In`The Psychology of Taste´, Jean Atnthelme Brillat-Savarin, says that “The pleasure of eating is one we share with animals, the pleasure of the table are known only to the human race”. The table, been it the ground or an elevated surface, is in fact the base and main stage for integration to act upon. Responding to the investigation done and tested through the events, the dining rituals in the Design of Interdine Restaurant are enabled by the presence of interchangeable tables of different sizes and heights. 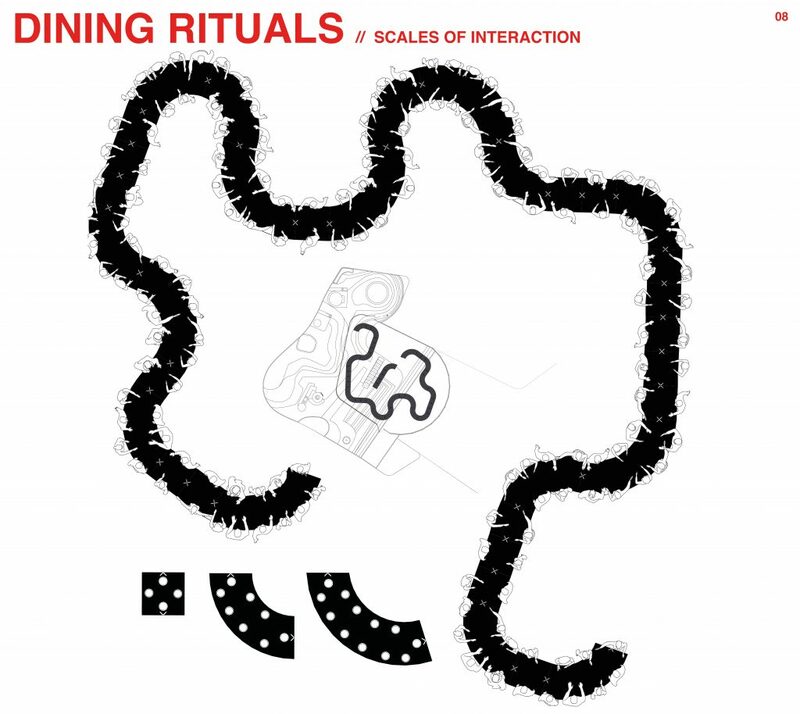 Aiming to maintain the intimate atmosphere for a `dialogue of reciprocity`, the tables allow different scales of interaction. 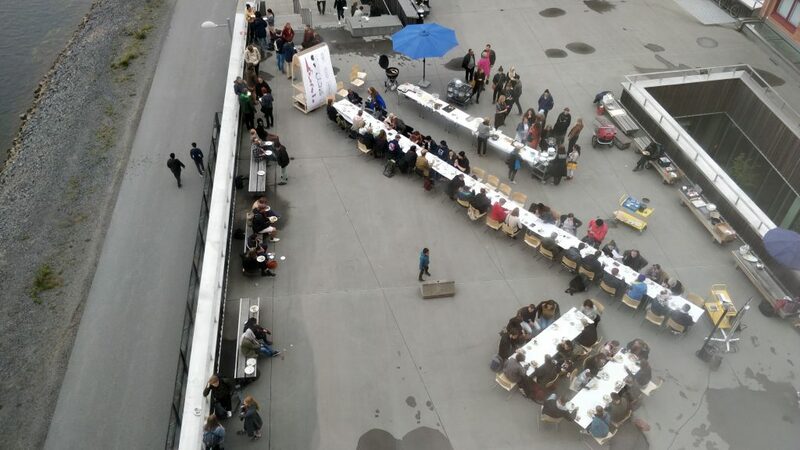 -while the biggest arch table allows a bigger dinner size (9-11 people). These different tables can also be combined together to create longer tables of different shapes, using the X joint present on the tabletop surface. This would allow bigger scales of discursive dinners and forums to take place on the second floor and terrace of the restaurant. Simultaneously, on the 1:1 scale of action, instead of a table, I created a mobile structure that can adjust to any kind of table size or dining ritual. The tool allows the table cloth to become the display for the dinner discussion and roll down onto the table surface or floor. The tool also incorporates shelves presenting guidelines for future hosts as well as instructions for how to use the tool. 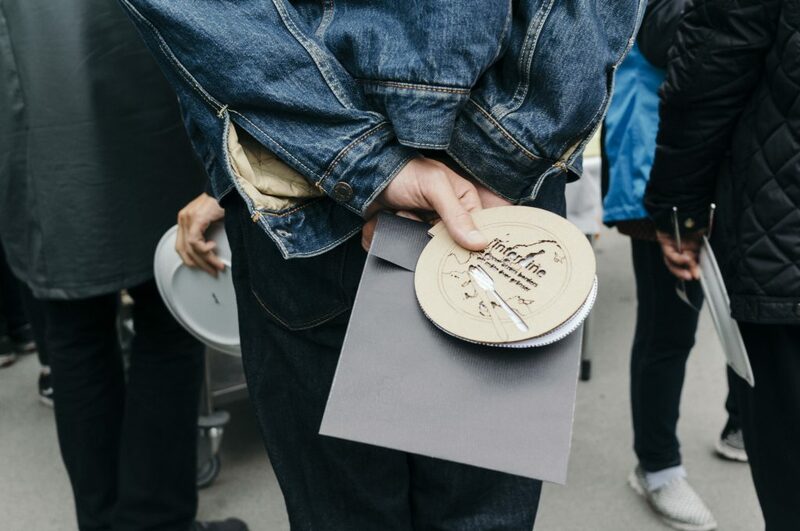 Open to future changes, the tool provides storage for the material needed for each dinner setting: menus , plates, zines, trays etc. 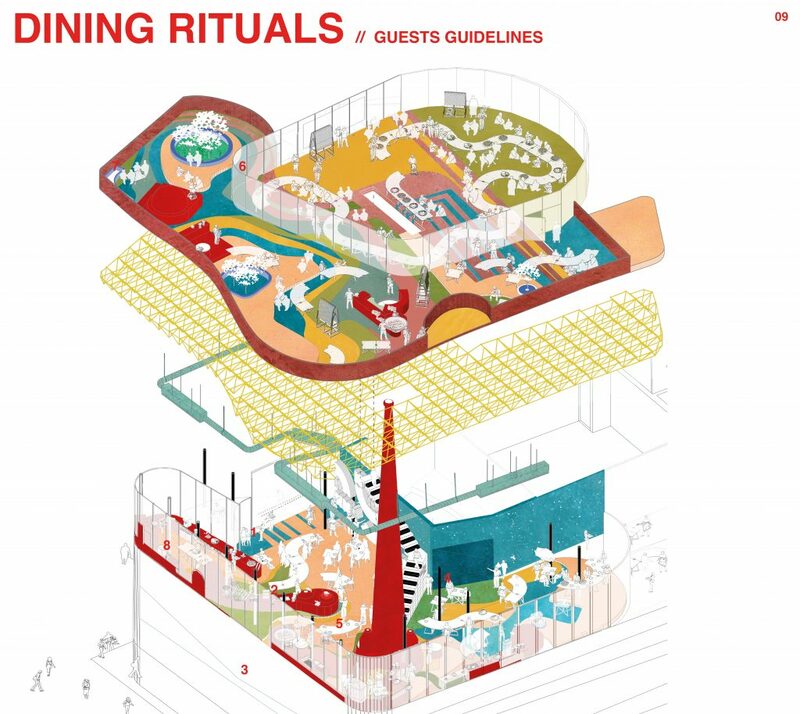 To what extent can we as architects talk about the design of a 'ritual'? To the extent to which one wants design to be able to affect people and their living experience. DINNER TABLE: each time of different sizes. Usually tables of 8 people are aligned together into a long line table. In this way the space provides an atmosphere of intimacy and security. 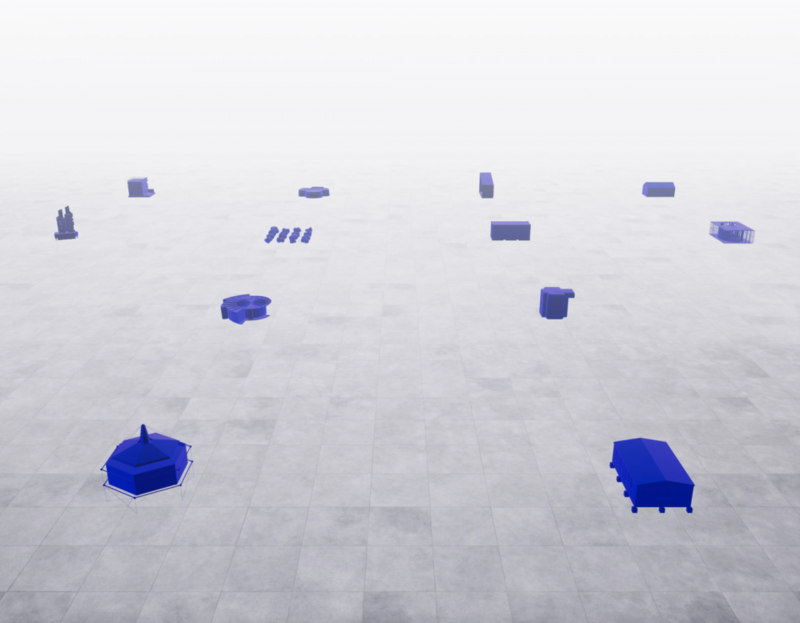 Yet the totality of the space composition invites confrontation and exchange. 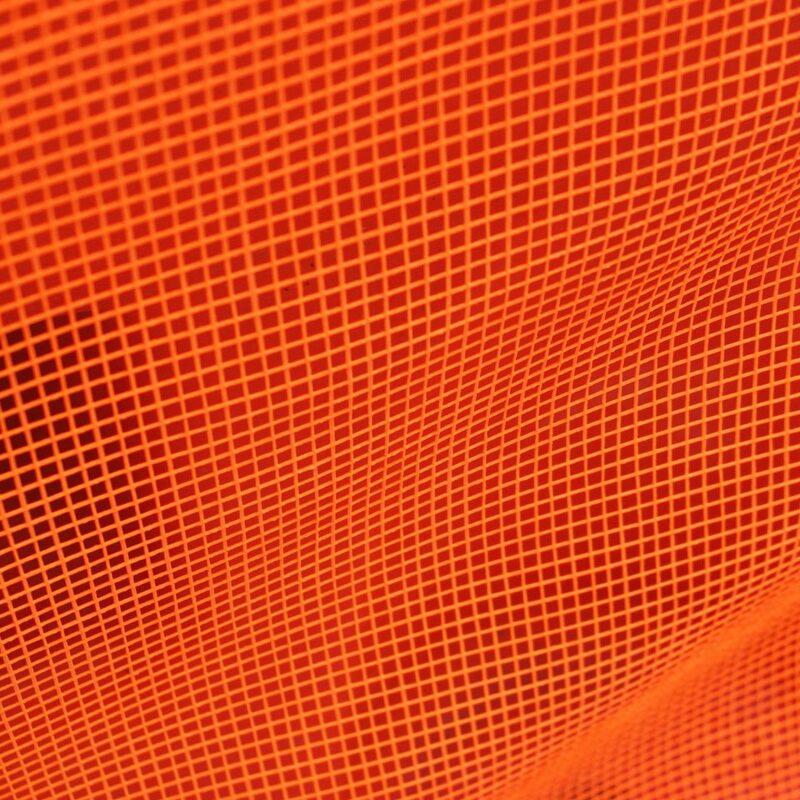 TABLE CLOTH: The role played by the table cloth is fundamental: its size, length and representation. The setting of the meal on the dinner table is often composed by a drawing or a map as a table cloth, elaborating on the discussion themes. cardboard menus to initiate the ritual and fanzines functioning as invitation cards as well as. 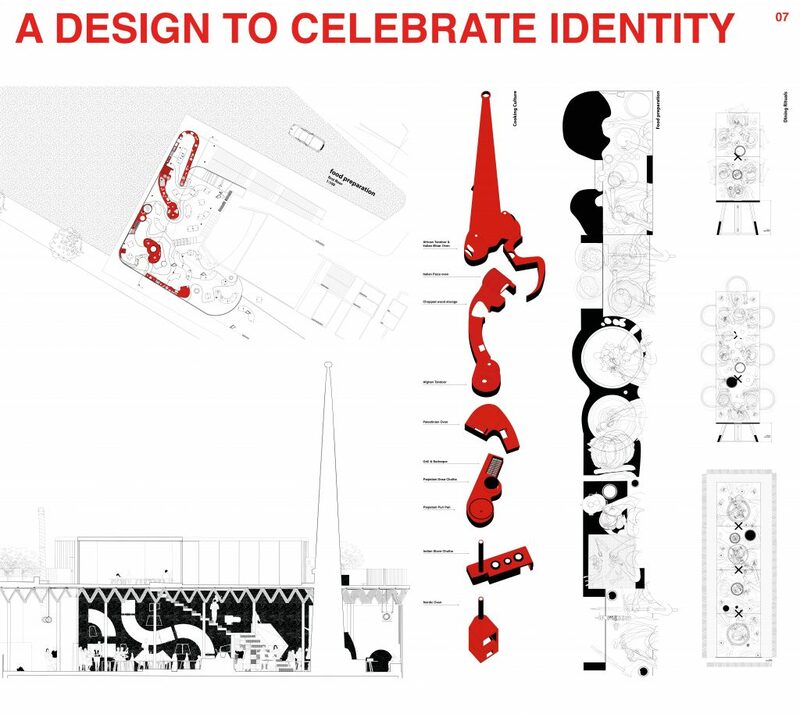 SITE: If situated in the public domain, the space is open, accessible and welcoming. Being located every time in a new place, each Interdine creates a new topography merging the meal setting with the surrounding. 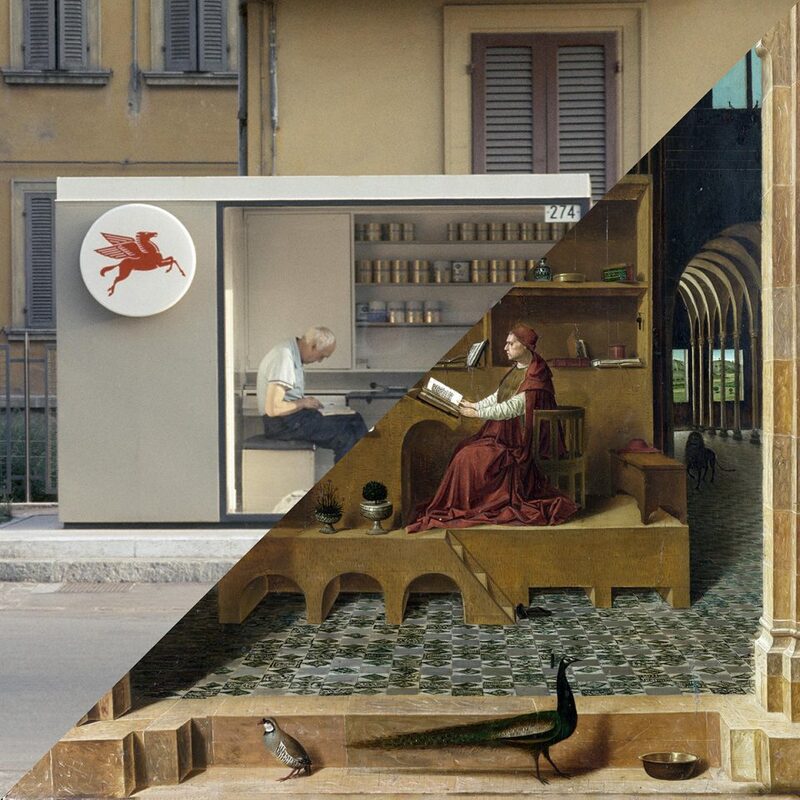 TIME DIMENSION: as the light plays an important role contributing to the event intimacy and comfort, the temporal character of the meal allows its replication and disclosure in different stages, from tactile, to emotional. In this way, design is used to allow specific interactions, encounters and exchange. What are your hopes for the project and its development into different iterations? The project main aim is to pass on and hand over the act of hosting to others: the hosted. 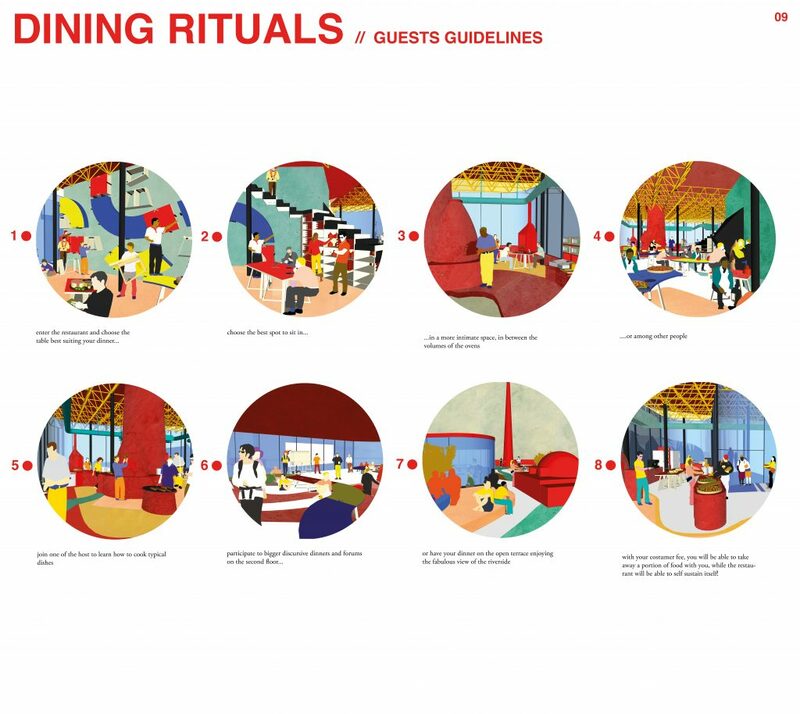 During time, a list of guidelines for future hosts and a series of artefacts and tools have been created to host each dinner. Interdine KIT is a gift to the future hosts, to help maintaining the network for integration alive and active in the city, while being open to changes and contributions. In the past, Interdine has allowed encounters through food, taught local inhabitants to learn from incomers, and to refugees to accept and embrace the culture they have come to. In the present, we keep on learning that integration is about receiving and giving. In the future, Interdine hopes that by changing the attitude towards the culture of integration we will be able to change the systematic processes and structures affecting it. The refugee crises is the way we deal with it. It is not about refugees, it is about all of us. We know that physical borders can stop and kill refugees, but can borders stop migration? The need for integration in our cities is not an opinion, but a fact shaping the whole Europe. 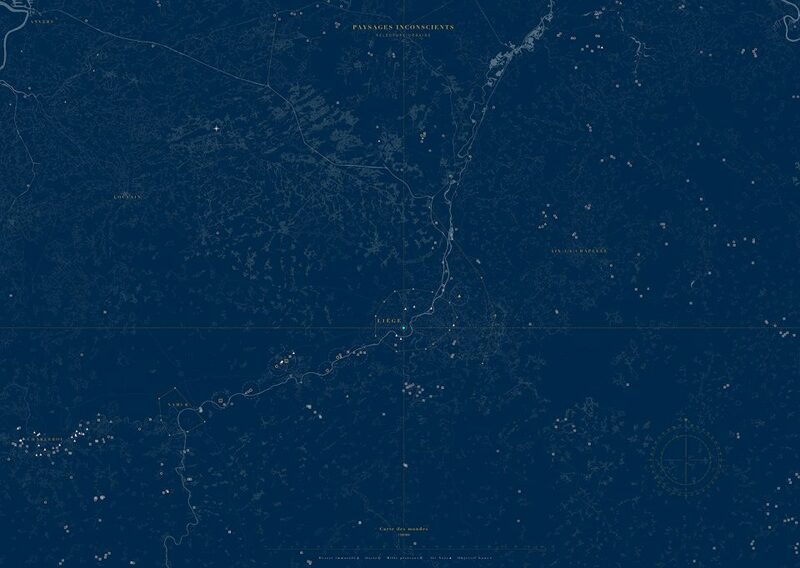 With its specific expertise of building human transactions in space, Interdine is not geographically limited to the area of Umeå. Seen as the ground on which to design social engagement possibilities, Interdine, in its two scales of action, is transferable to other European scenarios. Determined to shift the stigma attached to migrants and the negative narrative around population movements, the hope is to promote agency among refugees and local inhabitants to strengthen ties. Are you interested in exploring issues as integration further within this contemporary moment of crisis and beyond? Population movements, human rights and integration are important and fascinating subjects, specifically related to the time in which we are living. Keep practicing design and architecture in this field and continue developing Interdine as a methodology for integration and innovation would be an optimal future scenario. An idea to spread and involve a larger number of people, could be to create a media interactive platform offering a “package” of guidelines to host interdine at any time in any kind of space. To keep feeding into the platform, after having hosted the discursive dinner, the Interdine group could upload and share the set of knowledge created during the session. However, the financial aspect is always fundamental. On the side of crowd fundings and hypothetical scholarships, Interdine is a project that I need to keep developing in my free time, on the side of a job that provides a stable salary. This would allow me to have the means to keep developing this. 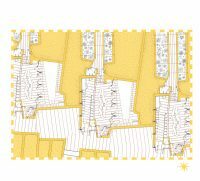 Space understanding and the analysis of spatial configuration should allow the architect to disclose the reality of space and its underlying layers of politics. In this sense, starting from a real problem, design can be used to disclose, facilitate and enable. In my opinion, as architects in the present society, our responsibility is moving away from the isolated act of designing beautiful shaped buildings. 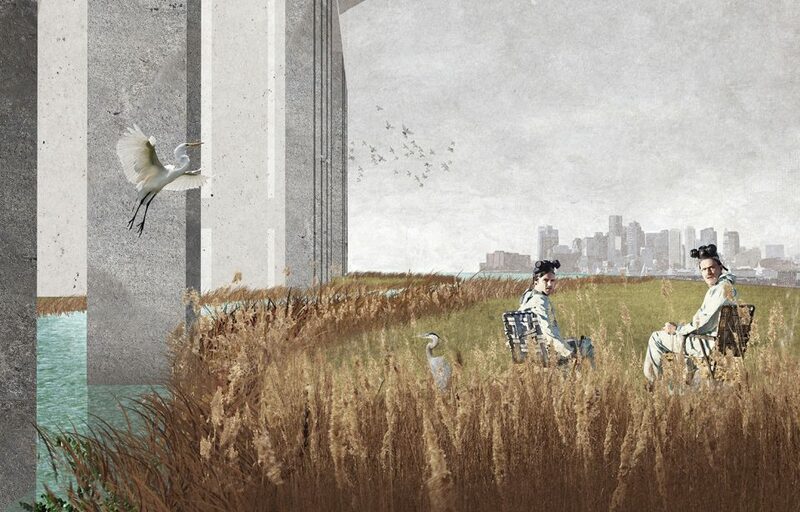 As spatial practitioners we should expand our agency, paying attention to issues of social concern. Our duty is to facilitate the right of every human being in the world to live in a decent situation, providing a sense of home, neighborhood and community. At the same time, we should encourage the design of social engagements and the disposition of relations between citizen.